Late returns from the river wards: Chicago wards were never as tidy as East Village boundaries, and the city-approved remap for 2015 seems to add to the confusion. East Village's 32nd Ward blocks and part of the 1st Ward made a last-minute shift to the 2nd Ward. 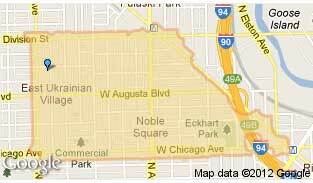 Neighbors are trying to figure out the new boundaries on the EVA Facebook page and the Everyblock East Ukrainian Village page. The spy who shagged Eva: At Monday's meeting Patrick Shaffner will talk about the writing workshop his spy shop The Boring Store is supporting, and Rachael Switall will introduce StudentsXpress, a school newspaper supporting child development. See you at the Happy Village!